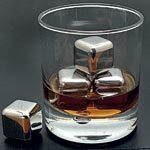 These natural non-porous soapstone cubes are gentler than ice, and sit pretty in your glass while cooling your drink. Each glass needs about three such dark grey stones, which should be refrigerated four hours prior to use. Bespeckled hand-cut granite cubes cool the whisky rather than harshly chilling it, leaving the flavour intact. You can plonk them into your drink after just half an hour of refrigeration. This centre-weighted stainless steel sphere does not roll about in your glass. Instead, it chills your whisky to perfection and tops it off with an edge of sophisticated glam.